Updated: Syria is cut off from the Internet, according to The Renesys blog and other media sites citing Syrian rebels, bringing about an isolation that many feared was coming to the country. The country is engaged in a citizen-led insurgency against the existing government, which was sparked after Syrian President Bashar Assad brutally cracked down on protesters. Starting at 10:26 UTC (12:26pm in Damascus), Syria’s international Internet connectivity shut down. In the global routing table, all 84 of Syria’s IP address blocks have become unreachable, effectively removing the country from the Internet. The OpenNet Initiative has outlined two methods by which most nations could enact such shutdowns. Essentially, officials can either close down the routers which direct traffic over the border — hermetically sealing the country from outsiders — or go further down the chain and switch off routers at individual ISPs to prevent access for most users inside. At the time Egypt took the second route to take the country offline, a process made easier by the fact that their were few ISPs to contact. It’s unclear how Syria disconnected its citizens. Some news reports say insurgents are communicating still via satellite phones, but the lost of IP addresses means no IP services can find their way to end users within the country. When a packet destined for a Syrian IP address is sent, it simply can’t find out where it’s supposed to go. Update: Here’s what that drop off in traffic looks like, courtesy of Akamai (s akam). This is one reason that technologies such as OpenBTS, Commotion, the Serval Project and other technologies to build out open source communications networks are important. While those may not ensure that people in Syria can talk to the outside world unless they have a satellite backhaul, they could still communicate with one another independently of the local ISPs. Photo courtesy of <a href=”2lights.net / Shutterstock.com“>Shutterstock user 2lights.net. a help to many people , but also, I hope they realize that internet access can also reveal physical locations. Is it possible, I wonder, for sabotures to cut off access ? Would that silenced voice be more helpful to oppressive governements or to rebels? or to amoral criminals? The main question is that if by using this tactic the oppressive regimes such as Assad’s in Syria or Ayatollahs’ in Iran would be successful to hold their people and their respective country hostage? I would say it is more like a final desperate attempt rather than a conclusive outcome. We are so lucky here to have our freedom and be able to use the internet. Sad for those in Syria! Shutting off the internet is akin to closing the door after the cows have escaped. Its too late…the minds and hearts of the people will speak in whichever way they can. Always have, always will. These governments are making futile attempts at stopping the wave of change….but it has gone BEYOND them. Just hope they’re all alright. Hi , We have a newly launched blog, takingonthegiant.com about young people, past and present who change the world. I want to follow your fine blog and hope you might be interested in following ours. We have landed into the middle of a big story and we thought you might like to become involved. Last year, Anjali Appadurai, a student at The College of the Atlantic, managed to address all the senior delegates at the United Nations Conference on Climate Change which was held in South Africa. Her brief, awesome speech got world-wide attention. But since the simple clear voice of a youth severely challenged the delegates in a way some of the more powerful members did not want to hear, at this yearâ€™s Conference in Doha, Qatar, Anjali has been kicked out. This the student who has been dubbed the youth voice of civil society. Imagine, being over in the Middle East, thousands of miles from home and being intimidated by Security officials. But she has kept her cool and the youth there supporting her have written a polite letter demanding her reinstatement. However, if Anjali is not reinstated, there most certainly will be an effort to mobilize young people around the world to support her. If you could take three minutes and link to her speech from last year and decide if you donâ€™t agree that she is a powerful voice representing the youth of the world: http://www.youtube.com/watch?v=Ko3e6G_7GY4. If you do agree with us, (and tens of thousands of others) consider doing a story either by linking to our website (or just steal from it, we donâ€™t care) to inform and involve your considerable followers. Young people dream of a better world but worry that it might not beâ€¦ this is a way they can act on their dreams. If you have any question, we would be happy to provide any assistance possible. This seems like a dumb, desperate move, but the average Syrian has bigger worries than lack of internet access. 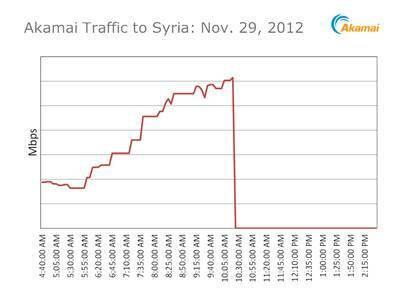 Most Syrians probably didn’t have regular internet access even before this country-wide cut-off anyway. Being cut off from food and water supplies is a far more pressing issue. What’s going on over there is scary. May the innocent be protected and down with the ASSad regime! Wouldn’t it add to civil unrest by taking away a freedom or what is considered a freedom to most people away. Most countries don’t like the freedom of speech nowadays so to control the population they shut it down. Wow I didn’t realize that the internet could be a blessing and a curse. Well, you know…. some countries shut down the internet to avoid people to think what their country is really doing, and… some countries have Fox News.